DNA testing kits are popular — and not only for people. Many dog owners want to learn more about their pets’ family history, genetic makeup and risk of future disease. Scientists with Embark Veterinary, Inc., makers of a popular dog DNA testing kit, and Cornell University’s College of Veterinary Medicine recently discovered a genetic mutation that helps explain why some dogs have blue eyes. Their research findings have been published in a peer-reviewed scientific journal, PLOS Genetics. The study is significant for a second reason. It’s the largest study ever to compare genetic data of dogs — in this case, dogs who belong to Embark customers. Besides submitting DNA samples, dog owners provided researchers with photos of their dogs and completed web-based surveys about their pets. Dogs with blue eyes are found in many breeds, including old English sheepdogs, border collies, dachshunds, Dalmatians and corgis. For these breeds, the blue-eyed trait is a recessive trait. That means two gene variants (known before as gene mutations) need to be present for blue eyes to occur. Previous research found that the “blue eye” genetic variants are related to coat color, specifically the merle (mottled patches of color) and piebald (a white coat with spots of color) color patterns. 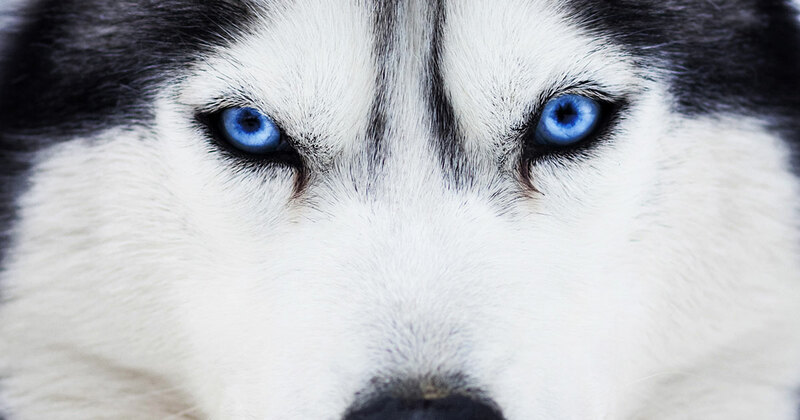 These genes didn’t explain blue eyes in tri-colored Australian shepherds or in Siberian huskies, however. To find the genetics underlying dog eye color, scientists compared more than 214,000 genetic markers from 3,180 pure- and mixed-breed dogs. As a frame of reference, dogs have 39 pairs of chromosomes compared to our 23 pairs. Researchers found two significant associations with blue eyes, one on canine chromosome 10 — the gene linked to merle color pattern — and one at a position on chromosome 18 that hadn’t been described before. When the scientists looked closer, they found a duplicated snippet of genetic material near a gene that’s important in eye development. The extra DNA was carried by 78 percent of non-merle-coated blue-eyed dogs and 100 percent of blue-eyed purebred Siberian huskies. Analysis of DNA from another 2,890 dogs confirmed the strong association between the mutation and blue eyes. The study included DNA from a total of 6,070 dogs, with 156 dogs having solid blue eyes or partially blue eyes. The scientists acknowledge there is more work to be done. They also recognize this discovery isn’t a major breakthrough in dog health, which is their ultimate goal. But it highlights the potential power of genetic data to unlock complex health conditions such as cancer and aging. And that will benefit the health of dogs everywhere.